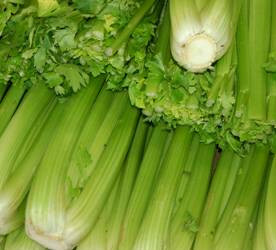 Pick celery that forms a compact bunch with stalks that are a light green color with a glossy finish. The leaves should also be bright green and fresh looking . Give it a gentle squeeze around the stalk to check for readiness. Rinse celery thoroughly to remove sand and dirt from the stalks. Nice addition to soup. Delicious raw in a crudités’ platter.